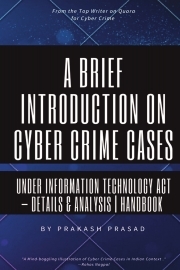 Description of "A Brief Introduction on Cyber Crime Cases under Information Technology Act: Details & Analysis"
This Handbook will serve as a reference point for cyber crime cases in Indian Context under the Information Technology Act & The Information Technology Amendment Act, 2008. Real Life cyber Cases with the applicable cyber law is presented in this book in a simple language. It will be a reference manual for anyone who wants to learn and understand law governing cyberspace in India. On an average a cyber law course will cost you about US Dollars 400. This book covers about 101 real cyber crime case study along with brief illustration and explanation of every section under the relevant Indian Law. Author is Cyber Crime Investigation Faculty, Cyber Forensic Analyst, and Blockchain Researcher. He has authored four books on Cyber Law, Digital Currency, Bitcoin, Blockchain and Cyber Crime Awareness. He contributes to Magazines of International Repute. He is also a contributor to Collaborative Online Investigation Network (COIN). He has been awarded Man-of-Substance form Asian School of Cyber Law. He had prepared TOR Handbook (Only available for Law Enforcement). Bitcoin Forensics, Dark Web, Banking and FinTech are other areas of his interest. Reviews of "A Brief Introduction on Cyber Crime Cases under Information Technology Act: Details & Analysis"